This year for Christmas I decided not to purchase toys for most of my grandchildren, and chose to make a Sabbath Day activity bag for their families to use at home. Starting in January, The Church of Jesus Christ of Latter-day Saints is changing our Sunday meeting time from three hours to two. We've been encouraged to teach our children about the Gospel and scriptures more at home using the Come, Follow Me resources. And in 2019, we'll be studying the New Testament. printable. 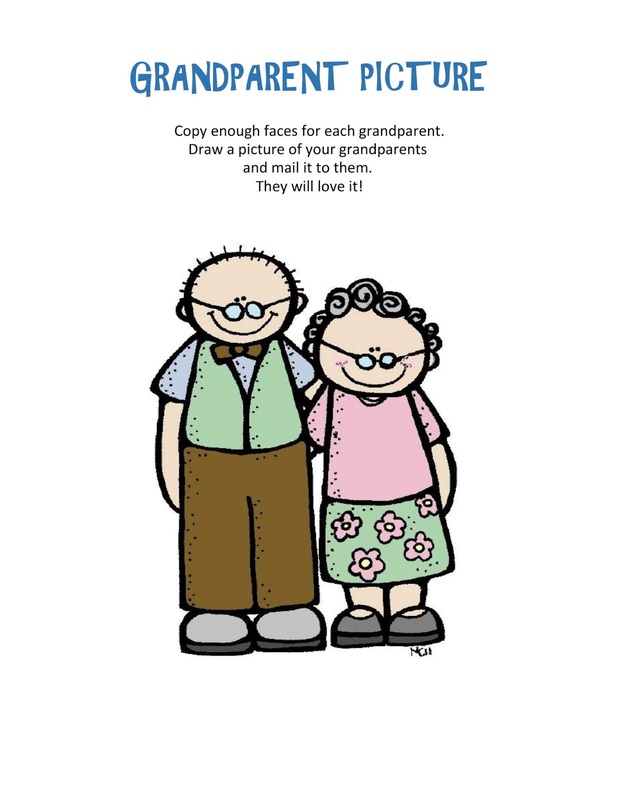 My ideas were draw a picture of your Grandparents, write a missionarey, Sabbath Day scavenger hunt, make a treat for the sweets, enjoy activity pages, watch church videos, read the Friend magazine, play a quiet game and do a smiley face attack. 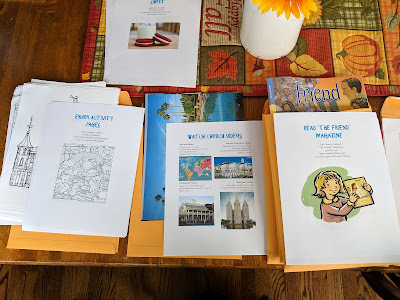 I used several manilla envelopes and tucked activity supplies inside each. 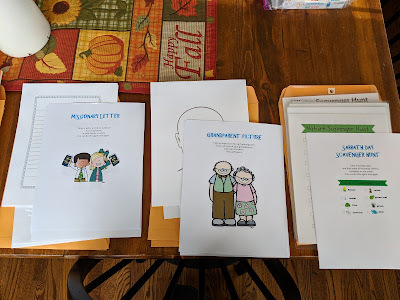 Then glued a title page with instructions on each packet. You can find my Sabbath Day Activity pages here. 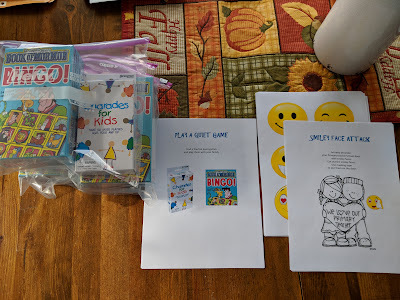 I purchased some children's Sunday books, quiet games and Sunday movies from Seagull Book. They always have great discounts in the back of their store. 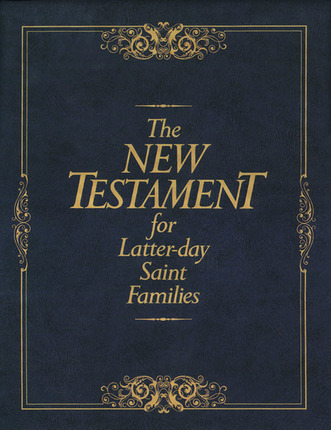 The most expensive part of my purchases was The New Testament for Latter-day Families for $50.00 for each family. I hope it can be used for many years. Lands End had some nice canvas zippered tote bags on sale for $32.40. I used their JOLLY code for the discount, but I'm still waiting for those to come in the mail. I wanted nice bags that could be used again and again. In total, I spent $100 for each family, and each family has three children. This was a super fun activity for me, and I hope it helps my children help their children have some memorable Sabbath Days. HI Valerie, I haven't posted to you in a long time and this is not on topic, but I wanted to thank you again. Most recently, because of you and your great blog and fabulous LDS preparedness advice a dear family member had an N95 mask in her emergency kit during the horrible California wildfires. 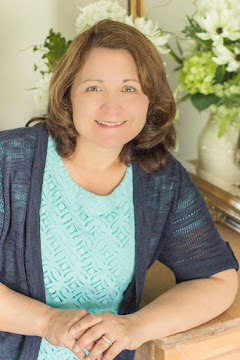 Just something I stuck in because of all of my LDS blog reading, so thank you. 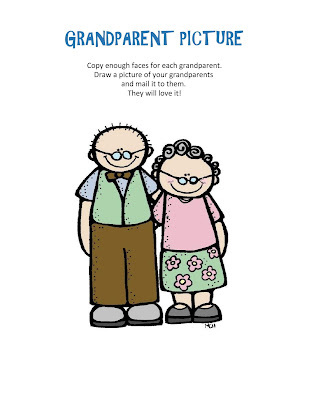 Also, you do not look like the curly haired, glass wearing grandparents in your graphics. Not even closely. Just a tip. Thanks again. Thanks for sharing that with me Eleanor! You are awesome! Thank you for this idea! I love it and with your helpful description and links I think I'll even be able to replicate it for my family. Thanks again! Merry Christmas!